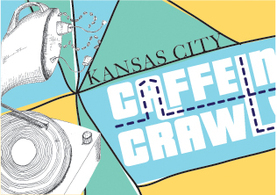 In the city that started it all, KC’s 4th annual Caffeine Crawl kicked off its Spring session with a caffeinated two-day event that delivered on its promise to be every bit as awesome as last year. Crawlers started the day at shops around the city with event bags in hand - goodies from One More Cup, Yelp, and sponsors About The Coffee, Rip Van Wafel, and Barista Magazine filled the burlap totes from Wholesome Sweeteners. As a Caffeine Crawl perk, the Libations iPhone App offered its coffee module free of charge for crawlers to track crawl tastings on-the-go, and Brian, repping our sponsor Unic, flew in from the West Coast to join us for the Midwest magic. Filling Station fueled its first group with fresh-juiced glasses of “Liquid Sunshine” and date-and-nut protein balls, and Shang Tea served their signature Red and Tangerine Blossom teas using an ancient Chinese brewing method. Little Freshie kicked off the Bike Route with Strawberry Rhubarb and Mexican Toddy Snow Cones, and crawlers snacked on soft pretzels while Lindsay explained her passion for real ingredients in their house-made syrups. Crawlers made their way to Quay Coffee for an exclusive tasting of their new summer drinks, including a Citrus Ginger Coffee Cocktail and a shaken iced latte with an egg white twist prepared by Andrew. A brief history on the River Market area that Quay calls home was rounded out by thoughts from the 2014 South Central Barista Champion, Tyler Rovenstine. At the Elbow Chocolates shop, we sampled all manor of chocolatey goodness, learned about the chocolate crafting process, and left in a happy chocolate coma. Crow’s Coffee rounded out Saturday’s routes with an exclusive sneak peek into their awesome, soon-to-open space and brewed Messenger Coffee and espresso drink samples from their enthusiastic baristas. Sunday dawned bright and early on the patio of Black Dog Coffee with the first-of-its-kind “After Crawl” brunch. With an open barista bar on sponsor Unic’s Stella di Cafe espresso machine, breakfast options from the Smokin’ Fresh Streetside BBQ food truck using Ibis Bakery’s delicious breads, Messenger coffee and cold brew from Alchemy, and a raffle for sweet prizes including crawl posters and a Baratza Virtuoso grinder that benefited Coffee Kids, it’s safe to say it was a complete success. At One More Cup, Stacy sampled out Cali Colas - a refreshing combo of toddy and Mexican Coca Cola - and explained toddy making at home with a gorgeous hand-drawn handout. Second Best engaged crawlers with great info and a gorgeous presentation of individual coffee flights of Kuma’s 95 scoring Panama Elida Estate three ways - espresso, kyoto, and clever. A buffet of sampling options awaited us at t.loft, with pomegranate green, white peach, and passion berry black teas complementing a signature house-made juice blend and plethora of gluten free snack choices. Mud Pie delivered their dependably stunning and scrumptious spread of vegan pastries alongside their “Dirty South” - a chicory coffee and alternative milk drink with cinnamon and nutmeg - and a demo of cashew milk in the making. At The Roasterie plant, Jon gave a great talk on coffee processing in Sumatra and we sampled different methods brewed different ways. Thou Mayest rounded out Sunday’s crawl with a preview of their stunning, soon-to-open space, and sampled hot brews and toddy while answering crawlers’ curious questions about the vision behind their company. After a high energy weekend with plenty of caffeine to go around, we are, again, awe-struck by a coffee community that collaborates and cooperates to make Kansas City a caffeinated metropolis wonder. We can’t wait for KC Session #2 in the fall, and in the mean time, you’ll find us drinking great coffee at a local shop, and loving every second!